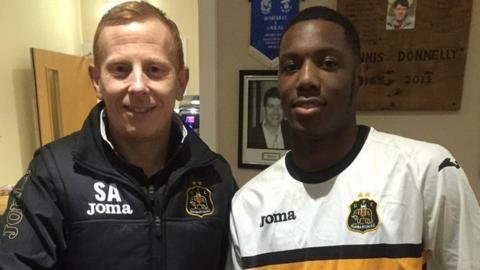 Dumbarton have signed Ghanaian striker Sebastian Osei-Obengo until the end of the season. The 21-year-old, who began his career with Bastia in France, joined Europa Point in Gibraltar's second tier last summer. Dumbarton manager Stevie Aitken told his club website: "Sebastian gives me another option in the striking department. "I'm looking forward to seeing what he can do for us." Osei-Obengo had impressed in a development league game against Greenock Morton in which he scored.